The secret is out! After a few month’s trial run, it’s time to share our newest venture with you. 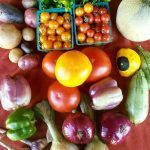 Newcastle Produce is now delivering weekly Local Harvest Boxes. Once a week our own farmer, Travis, gathers produce from our own Twin Brooks Farm and other local farms and fills boxes with the local bounty. He loads the boxes into the van, delivers them to the hungry folks on the Georgetown Divide, and we’ve watched the interest grow. Along the way we’ve learned a lot about supply and procurement, packaging, transport, bookkeeping, and what to plant next year. 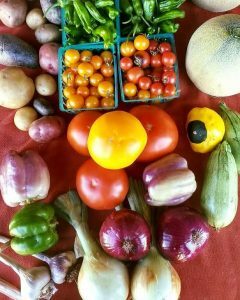 With August here and its promise of bountiful harvests, we’re adding a few more boxes and locations to the list, so if you are interested in getting a weekly delivery, go to the Harvest Box page for more information. We are also introducing Build-Your-Own-Meal Boxes. Imagine being able to order meal items to fill out your weekend menus so you can spend your time doing something else besides cooking. Chef Chelsea has designed weekly menus based on local, seasonal produce and seasonal flavors, including entrees, pasta, soups and salads. Order as many or as few items as you wish in sizes portioned for 2 or 4 persons. Entrees will be uncooked with instructions on how to bake at home. Pasta, soups, and salads will be fully prepared and pre-cooked for heat and eat, or serving cold. You will be able to view menus and order up to three weeks in advance. 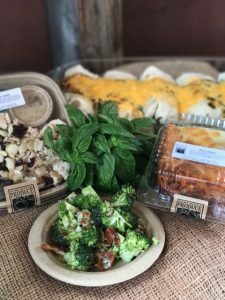 All Build-Your-Own-Meal Box orders need to be placed by Monday before 6 pm to pick up on Thursday between 3-6 pm. Orders can be placed online or in the store. Go to the Build-Your-Own-Meal page for more information.